With increases in renewable generation and advances in battery technology, the energy storage market has begun to take off, especially for small-scale batteries. The Tesla Powerwall battery has become a household name since its first release in 2015 and second model in November 2016. Though one of the most-recognized small-scale batteries available, the Powerwall is not alone in the expanding small-scale energy storage market. LG, Mercedes, Panasonic, Nissan, and other international companies all make small-scale at-home batteries. Smaller companies like Pika Energy in Maine have also carved out a place in the market. Given this recent growth, Synapse set out to analyze the benefits such technologies provide to the utility system and to customers. Energy storage technologies feature round-trip efficiency, meaning they lose some energy between charging and discharging a battery. As a result, customers use a bit more energy with a battery than without one. Instead of reducing energy in every hour like an energy efficient light bulb, batteries provide value by supplying energy when there is a greater need for it. Customers who use a battery shift their energy use from the grid to different hours, resulting in a flatter load shape and energy cost savings. These customers use more energy during off-peak hours as the battery charges but save energy during peak hours, when the battery is discharged. As the grid integrates more renewable energy, batteries can be set to charge when renewable energy output is the greatest. Most batteries can be dispatched by a utility or third-party with control software or managed directly by the customer; the controller or customer can schedule the battery to charge and discharge at hours when energy is most needed and when using that energy is most cost-effective. Synapse modeled a program design that charges customers’ Tesla Powerwall at-home batteries each night and discharges them each day. Other dispatch scenarios that could further optimize cost-effectiveness or customer appeal exist—we chose this one for simplicity. Overall, our modeling shows that batteries deliver a variety of benefits to the utility system and customers. 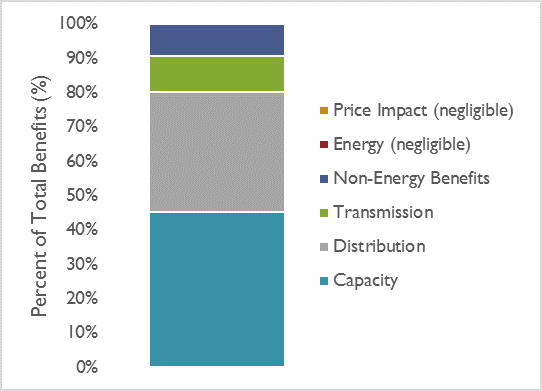 Figure 1 below shows capacity and distribution benefits provide the bulk of utility benefits, transmission and non-energy benefits provide some benefit, and energy and price impacts are negligible. Batteries provide value to the utility system through the ability to reduce peak consumption. This means they avoid capacity and transmission and distribution (T&D) costs, potentially deferring costly T&D upgrades. To achieve maximum capacity savings, batteries must discharge the most energy they can during the peak hour of the year. They could produce even greater T&D benefits if deployed in capacity-constrained areas. While utility benefits can be identified and quantified, benefits to customers depend on a customer’s circumstances and reasons for installing batteries. The following are key customer motivators for installing at-home batteries. Small-scale batteries are an attractive investment for customers with time of use (TOU) rates. Customers with TOU rates would likely see bill savings if they shift usage from high- to low-priced periods. Currently TOU rates are not widely available in many states, often due to lack of advanced meter availability or customer acceptance of a new rate structure. By pairing a battery with rooftop solar, a home, apartment complex, or business owner can keep more of that solar generation on-site. It is likely that a customer with a battery and rooftop solar will have a flatter load shape than a customer without either technology. For example, I have solar panels on my home but work at an office from 9am-5pm during the week. My solar panels generate most of their energy at around 4pm each day, but I’m not home then to use it. With a battery, I could store that excess energy and use it in the evening to make dinner, do the laundry, and watch TV. In extreme cases, with such an arrangement a customer could go completely off grid. Customers interested in back-up generation may opt to install batteries instead of a fossil fuel powered generator. This is especially true of customers with rooftop solar who can charge the battery during the day when an outage occurs. Customers may be motivated to install batteries for the non-energy benefits they provide—such as back-up power, system reliability, or increased property value—to both the utility system and the participant. The cost to install a battery may deter or prohibit customers from installing one. However, utilities and program administrators are increasingly investigating incentive programs to encourage greater adoption of storage technology. Batteries can provide benefits to the utility system by aligning customer-sited sources of energy with system peak load hours. Batteries also provide benefits to customers by reducing bills with TOU rates and providing back-up power. How quickly utilities and customers will continue adopting the technology remains to be seen and depends on policy decisions, transitions to TOU rates, battery and energy costs, and other market motivators.